Crock-Pot makes so many great slow cookers that it can be difficult to choose the right one. Well if you’re a gadget fan who opts for devices that are “smart” and “connected” whenever possible, we’re about to make this decision so much easier for you. 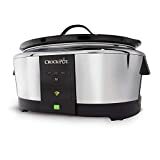 The Crock-Pot Wemo Smart Wifi-Enabled Slow Cooker is on sale for nearly half off today on Amazon, dropping the price to just $79 from its full retail price of $150. This is a killer deal you definitely won’t want to miss.